The ‘Metroidvania’ subgenre of platformer was birthed by Super Metroid and turned into a full-fledged genre with Castlevania: Symphony of the Night. Strangely, most of the subsequent entries in the Castlevania series that follow in Symphony’s footsteps have more or less been exclusive to handhelds. But that only really means that handhelds have been seeing quality Castlevania releases. 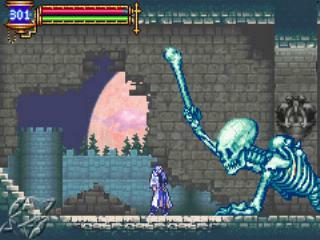 This was especially the case with the Gameboy Advance, which saw the release of three such Castlevania titles. The third of those GBA games, Aria of Sorrow, is widely acknowledged as one of the best game’s in the system’s library, and one of the best entries in the entire series. It’s well-deserved praise. In the twelve years since its 2003 release, Aria of Sorrow hasn’t lost a step. In a change of pace, Aria of Sorrow’s story doesn’t take place in the past, but in the future of 2035. 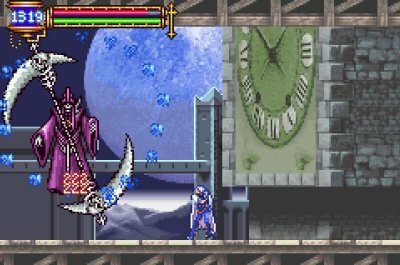 Dracula, as it turns out, had been soundly defeated by the Belmonts and Alucard in the year 1999, with his soul and castle being banished in an alternate realm within an eclipse. Soma Cruz is an exchange student in Japan, and as he and his friend Mina are about to visit a shrine, it suddenly becomes a gateway into the eclipse, and the two find themselves in Dracula’s castle. A prophecy that tells of Dracula’s reincarnation inheriting the vampire lord’s powers has a number of characters – both good and evil – searching the castle’s chambers to either prevent or fulfill the prophecy. Players take control of Soma, who has gained newfound power in this other world. 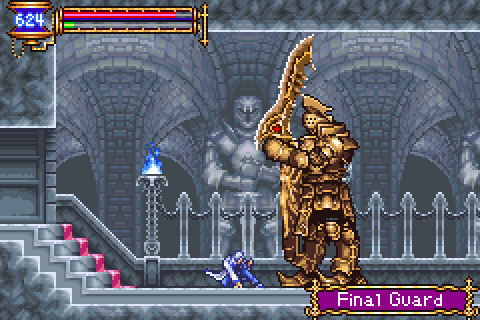 Much like in Symphony of the Night, the player starts off with very little to their arsenal, but they progressively gain new powers and abilities that both make Soma stronger in battle and open up new areas of the castle. The gameplay is incredibly smooth, with combat and platforming feeling simple and fluid. New weapons, armor and accessories can be found in secret rooms, by defeating enemies, or bought by a man named Hammer, who sets up shop in the castle early in the adventure. Additionally, Soma gains experience points every time he defeats enemies, and can level up after gaining a set amount of experience points. This gives the game an RPG sense of depth, similar to Symphony of the Night. Aria of Sorrow admittedly plays really close to Symphony’s playbook (though that’s certainly no sin), with many of the castle’s locations almost feeling carried over from the Playstation classic, albeit with a different layout. What sets Aria of Sorrow apart and gives it its own identity, however, is its introduction of the Tactical Soul system. The Tactical Soul system allows Soma to steal the souls of defeated monsters, which grant Soma new abilities. Enemies often have to be farmed before you can claim a soul, but the fact that every enemy gives you a new power gives the game an insane amount of depth and variety. Souls come in four forms: Bullet, Guardian, Enchant and Ability. Bullet souls work as a replacement for the series’ secondary weapons, and are mostly ranged attacks like throwing knives or shooting lightning from your hands. Each use of a Bullet Soul uses magic points, which are replenished with collectible hearts (or potions). Guardian Souls are continuous moves that eat up magic points until deactivated, like transforming into different forms or summoning minions. Enchant souls are always in effect when equipped, and thus don’t require magic points. Abilities granted from Enchant souls can range from mere stat boosting to walking on water. Finally, Ability souls are usually found after boss fights, and give Soma abilities that are necessary to delve deeper into the castle. Unlike the other types, they are always active and never need to be equipped (though the player can turn their effects off if they choose). It really is a simple addition to the series, but one that has a powerful effect on the game’s content and longevity. It’s as addictive as collecting Pokemon. And much like Pokemon, the game’s original GBA release gave players the ability to link up to trade souls, because chances are you won’t be able to grab them all in a single playthrough. Unfortunately, like so many linking features before it, the trading aspect of the game is absent in the Wii U Virtual Console release. The game also looks great, and somehow seems to have made the transition from GBA to Wii U better than most, visually speaking. Sure, Soma’s character model lacks defining features, but that’s forgivable when taking into account the screen the game was originally made for. The game’s art direction and animations also hold up really well. As is a recurring element of the series, Aria of Sorrow features a stellar soundtrack, though it might not quite stack up to the series’ finest scores. 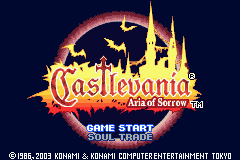 If you enjoy Metroidvania titles even the slightest bit, you owe it to yourself to play Castlevania: Aria of Sorrow. It may have been compacted for a handheld, but it exudes as much depth and content as its console counterparts. The gameplay is great, and the Tactical Soul system pretty much means you can change things up in nearly countless ways. The graphics and sound have aged nicely, and several unlockable modes, multiple endings and even the ability to play as a secret character means that the game will outlast the ten or so hours you’ll put into the standard quest. Does Aria of Sorrow match the brilliance of Symphony of the Night? Not quite. But it comes a lot closer than it has any right to. That it should be compared so frequently with such an esteemed predecessor is quite a statement in itself.